The lowest electrified strand (conductor) of the netting was in contact with combustible vegetation. The continuous current from this particular energizer combined with the vegetation to ignite a serious fire. 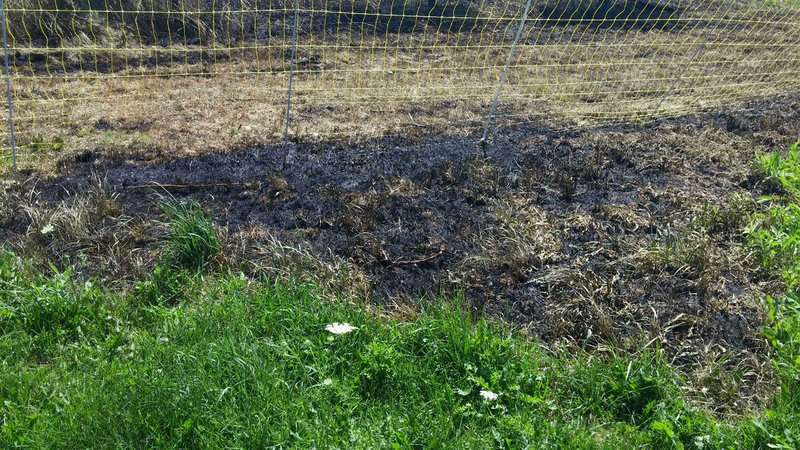 A fire burned grass, trees, and a UTV and was only 30 ft from a barn when the fire department arrived. It occurred because the property owner purchased both our netting and another firm’s “continuous current” energizer via Amazon’s website. In making the energizer purchase he relied upon Amazon’s “Frequently Bought Together” section and the energizer’s reviews. No mention on the Amazon website was provided about a risk of fire or of damage to electrified netting when used with this energizer. A 6 wheel UTV that was destroyed by the fire. Was Premier’s netting the cause of the fire? Absolutely not. This fire would never have occurred if a pulse-type energizer of the right size from Premier, Speedrite, Stafix or Gallagher been used. Would it have mattered if the fence wasn’t netting? A fire can (but does not always) occur if and when a “continuous current” energizer like this one (shown in photo) is connected to any conductor (netting, tape, rope, twine, wire) that is in contact with combustible material (brown grass, leaves, straw). It’s a factor, of course, that netting for chickens has conductors close to the soil and, at times, close to combustible dried grass or leaves. So it was the type of energizer (not the brand) that caused this fire? Yes. What enabled this unit to cause a fire for this user is that it, as its front label indicates, is a “continuous current” fence energizer. What is a continuous current energizer? It’s a very old design that is cheap to manufacture—thus the “attractive” low retail price. However, unlike 95% of the energizers sold today, it does not release an intermittent pulse. Instead, it charges/energizes the wire continuously at, as the label on this energizer indicates, not more than 1200 volts. Buy one large enough, in joules of output, to be effective. That varies according to the situation, animal to be fenced, etc. Too many Amazon “suggestions” are for energizers that are too weak. Don’t rely solely upon website reviews. They can be dangerously wrong as proven by the reviews for continuous current fence chargers. If you’re unsure, contact a fence specialist. Premier’s experts have years of experience and can help. Call us toll-free: 800-282-6631. 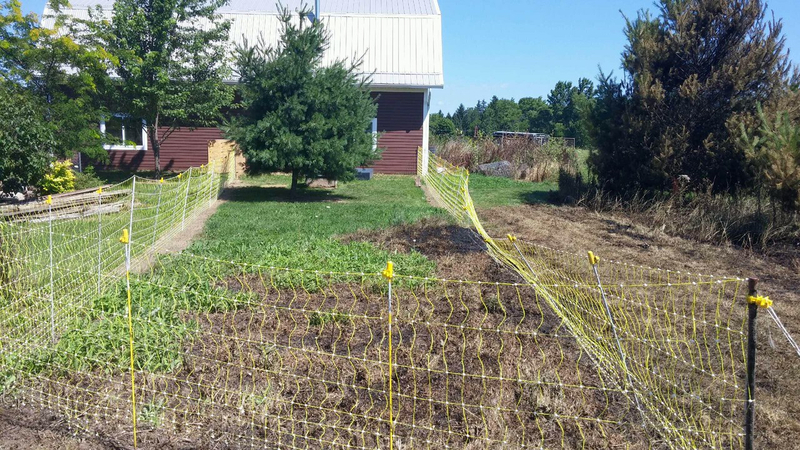 The user had killed the grass under the fence with a herbicide before installing the netting. The fire was 30 ft from the barn and house when the fire dept. arrived. It could have been much worse. How, by comparison, do pulsed energizers work? Most modern fence energizers send very brief (less than 3/10,000 of a second in duration), high voltage (usually 2000-6000 volts) pulses of electrons down the conductor every 1-2 seconds. Though powerful enough to deter animals and poultry, pulses this brief and this infrequent almost never pose a fire risk when the conductor is near combustible material. There simply isn’t enough “on” time for heat to build and allow ignition to occur. Are continuous current energizers also available in farmstores and other mail order sources (not just Amazon)? Yes they are—and have been for decades. And for 35 years Premier has told potential customers not to use these units with our electrified fences. But a low price is hard to resist if the customer doesn’t know the difference. As you can see from the reviews of this fence charger on Amazon, many customer views about them are not accurate. That the energizer is rated with 4 stars adds to the confusion. The label calls this a “low impedance” energizer. Aren’t low impedance energizers the pulse type and thus safe? Until now that was true. This is the first time that we’ve seen “low impedance” on the same energizer as “continuous current.” Unfortunately, this encourages folks to buy an energizer that will damage netting and is a potential fire risk. So why does Amazon imply buying these units for use with Premier’s netting? We suspect that Amazon’s software is automatically linking the two products based upon price and sales numbers without regard to risk or effectiveness. We also note that Amazon repeatedly suggests pulsed solar units for netting (not just Premier’s netting) whose output is too low to be effective in most situations. Have there been other similar situations? Or, is this the only one? We’ve had several Amazon customers call us to report melted spots in netting. 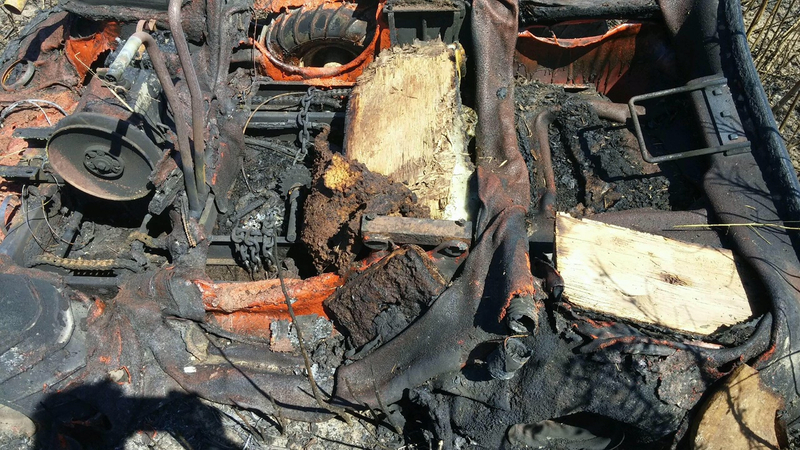 In each case the cause was a continuous current charger—but in these situations combustible material was not present. For these folks the heat melted the plastic in the strands but did not start a fire. Here’s the problem, folks. This is a screenshot of a page on Amazon’s website. 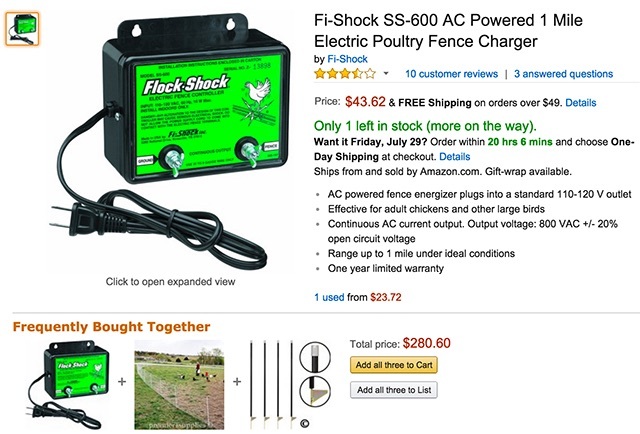 Note that its “Frequently Bought Together” section combines Premier’s PoultryNet® and Premier’s FiberTuff™ Posts for corners with a “Fi-Shock™ Electric Poultry Fence Charger”. The description notes that it is a continuous AC current output—which means that it will melt the strands of netting when the fence touches a green weed…and can start a fire if the right conditions exist. We’re confident that this dangerous (and potentially very costly to you) combination is not due to malicious intent by Amazon. Rather it is an unintended result of their software. We hope they change this…very soon. 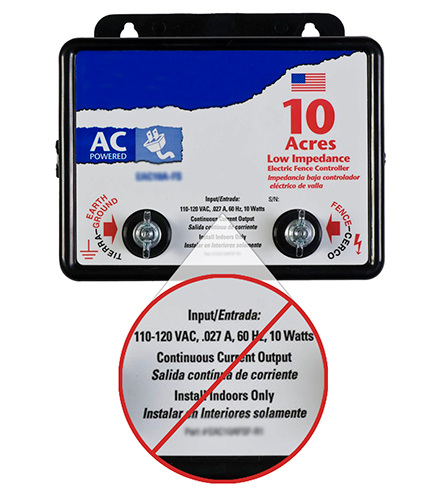 It’s your decision whether to buy this unit…but we very strongly advise against using this fence charger (or any continuous output fence charger) for any electro-plastic electric fence conductors of any brand or source—whether netting, twine, polywire, tape or rope. 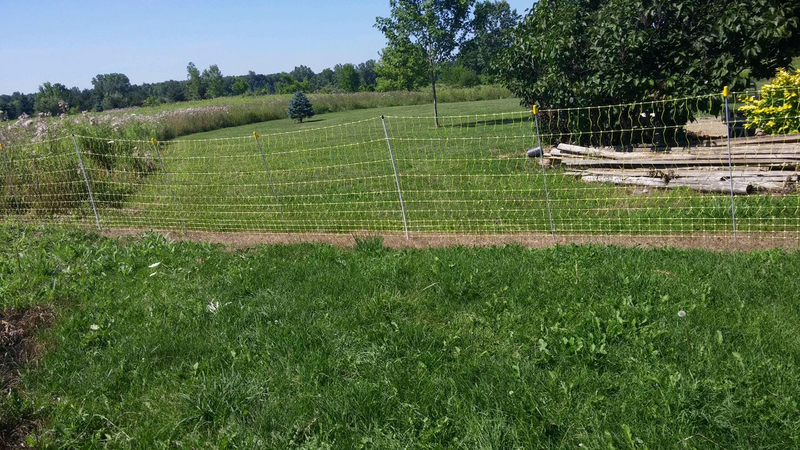 This is why you should not trust the sales information regarding electric fence when the source is not an electric fence specialist. If you’re unsure, contact a fence specialist online or call us toll-free: 800-282-6631.